emmatree: stop. this isn't about the dragonfly. it's so often not about what you think it is. it's too often about what draws your eye, your ears, your bleeding heart; you rush to put the other lens on the camera so you don't see the background, the background falls away, the background you want to ignore, the background that hangs there so beautifully true when you move the camera away from your eye. when you allow yourself to see. painter's eye sees that curve of darkness above the dragonfly, and the just beginning to fall leaves scattered across the creekbed, knows the strokes of light painted with a wide open fstop. painter zooms back and blesses the knowledge of this place, of this moment. it is about seeing it all, and choosing what to ignore. photographer's eye ignores the shards of monkey grass and f16, and hands the camera to painter's eye. although i STILL want to see a red dragonfly! this place, this moment, always paints the best picture. beautiful photo and perfect words. and f16 is for the realists in life. F4 is for the dreamers. I am not a painter but I can appreciate how beautiful these words (and the shot) are. you are a fabulous writer, and i take your words to heart and hold them there. muchas muchas gracias. are catching beyond the intended is almost as breathtaking as the intended. sometimes more so. it changed how i look...at everything. my obcession? sunlight and shadow. somedays i lose myself chasing the shadow! beautiful words emma tree, as oh so true! But I must say your dragonfly is just beautiful and so different than mine. 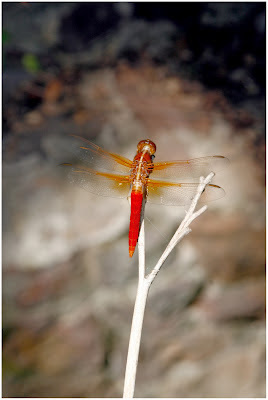 Come by, I just posted a dragonfly today. Beautiful put....and right on the money. Ah yes, the world, with lens wide open. Selectively focused, just like our eyes. Learning to See ... What else is there? this is kind of what i have been doing lately... choosing what i want to see, choosing what to fcous on : the beauty, the blessings, the good.